Across our own website and Amazon UK, we now have over 1,000 Customer Reviews for our coffees. This includes almost 600 Reviews for our ever popular Signature Blend. An analysis of these Reviews confirms we are consistently delivering on the customer promise which we believe makes Spiller & Tait different to other brands of coffee. Flavour - we select the highest quality beans and, in partnership with other expert roasters, we aim to roast coffees which just tastes great. All of our coffees, whether single origin or blended, are designed to be balanced, rich and lacking bitterness, while enhancing the subtle flavours inherent in the beans. We know these are taste qualities that are valued by today’s coffee drinkers in the UK. Thankfully, our customer reviews tell us overwhelmingly that we are getting this right. Over 1,000 reviews have told us our coffee is really delicious. Freshness - coffee bought from our site is roasted weekly in small batches, so you receive fresh coffee with maximum flavour and aroma. All coffee bought from our website will reach you within 7 days of the roast date, so the coffee will be well rested when it reaches you (see Resting Coffee LINK). Having only a small range of coffees means we have enough time each week to roast all our coffees with the care and attention they each deserve, ensuring they have maximum flavour. Again, our reviews tell us that, more often than not, we are delivering on this promise and the freshness of our coffee really enhances its flavour. But, where we have sometimes struggled is in delivering this promise consistently on Amazon. Although we still send our coffee in each week in small batches, sometimes Amazon’s stock rotation lets us down a little and a bag of coffee can sit in a warehouse for a few weeks or even months. Most negative review feedback has related to this scenario. There isn’t much we can do about that, but increasingly our prices on Amazon will reflect the fact that our coffee bought on Amazon might not be as fresh as it will be when bought from spillerandtait.co.uk. Knowledge - you may be buying great coffee, but you have a role in making it taste delicious! 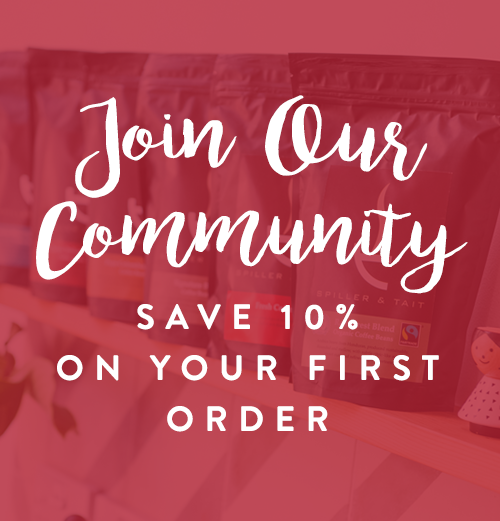 So, we actively share our coffee making knowledge via the Coffee Tips on this website and via our Community (LINK), to help any ensure their coffee tastes great. However, when you become a customer, much more support is available to you. We e-mail coffee making tips with each coffee we sell and we regularly engage with customers via phone, e-mail and social media messaging to answer questions and advise them on how to get the best from their coffee making devices. It’s something we enjoy doing and we are regularly commended for our "old fashioned" focus on service, which also comes across in our Reviews and other forms of customer feedback. What we’ve learned from over 1,000 Customer Reviews is that our coffee is often cheaper than other craft roasters (for similar coffee) and is judged by our customers to be “great value for money”. We also know for sure that we are hard to beat on Flavour, Freshness and Knowledge because our Reviews have recently confirmed that this is what most of our customers experience when they buy our coffee.